Avocado Nutrition - What to look for. Avocado nutrition may surprise you. It's loaded with so many good things our bodies actually need. It's not only rich in fiber, protein and omega-3 fatty acid, but also delivers many other essential vitamins and minerals too. This magical fruit that grows on trees is native to Mexico and Central America. It flourishes well in warm tropical climates and also goes by the name alligator pear. The big plus is, even though these gems come from a tropical climate they can be found year round in all the big supermarkets. Some people are not a fan of the avocado and for others it's a love affair. With their silky texture and unique flavor it is not hard to incorporate them into many of our meals. If you are a fan, consider yourself lucky, as once you read all the benefits of avocado, it's not hard to come up with more ways to eat them. Some people even say that avocados are considered one of the healthiest foods to eat on the planet. So what does avocado nutrition provide for us? They are a good source of protein, making this fruit a huge plus, especially for vegetarians. It is also a handy substitute if you are trying to cut back on your meat intake. In any situation, it is a great way to get your protein. Helps regulate blood sugar levels, and prevents constipation. Provides healthy fat that your body needs (like the kind in olive oil), that boosts levels of HDL, which is short for high-density lipoprotein. HDL cholesterol is actually good for us, unlike the LDL (low-density lipoprotein) or bad cholesterol. Some studies have shown that this type of healthy fat can help lower cholesterol levels. Considered to have anti-inflammatory due to its combination of certain vitamins, minerals, omega 3 fatty acids and carotenoids. Avocados are rich in omega-3 fatty acids and studies have shown that a diet rich in omega 3 may help lower the risk of heart disease. 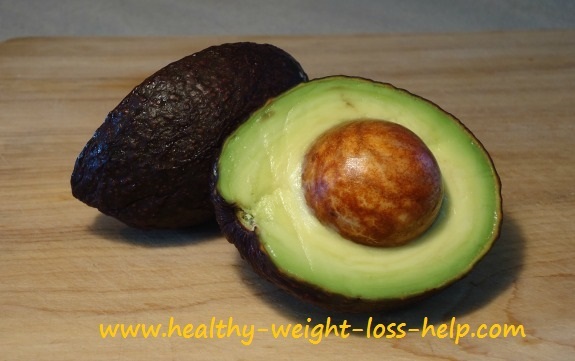 Avocados are an excellent source of carotenoids and antioxidants. These not only help detox the body, but carotenoids offer things such as vitamin A and lutein, which is necessary to maintain proper eye health. As nutritious as avocados are they can be considered to be high in calories. So if you are watching your calorie intake you may want to keep the portion sizes moderate. (Every 100 grams of avocado contain 160 calories). The great thing is that smaller amounts still offer big benefits meaning this is a fruit worth eating in moderate portions. Instead of butter use an avocado spread on sandwiches or toast. Not only healthy, but delicious too. Scrape as much of the meat away from the skin so not to waste any of the avocado. 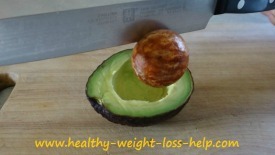 There is an easy way to remove the pit of an avocado. First, take a knife and give the pit a good wack in the middle of it, so the knife sinks into the pit well enough to get attached to it. As you can notice from my picture I didn't exactly hit the center of mine very well, but it will still work. Since the knife is embedded into the pit, give the knife a twist and pull up, this should lift the seed right out of the avocado with ease. If this doesn't work the first time, no worries, practice does make perfect. 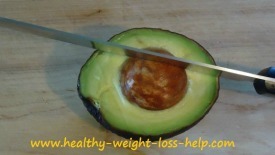 For this to work well the avocado should be ripe (but not overripe as in mushy). Try to avoid buying avocados that are overly ripe. Those are not as good as they are dented and too soft. If you want to use them right away, then ripe (but not dented) is perfect. You can also buy them when they are still hard and green (like when you buy bananas that are still green) and you have the time to leave them out for a few days to ripen up on their own. When it comes to avocado nutrition, pages upon pages could be written.